Today, Apple CEO Tim Cook made some pretty lofty claims about Apple’s next generation of products. Apple unveiled the next line of its products today at the Bill Graham Civic Auditorium in San Francisco, and (as expected) they appear to be stepping up their game. As usual, two new iPhones were announced, but it was the new iPad and revamped Apple TV that stole the show. Some say that it’s a small world, and thanks to our advancements in technology, the world may have just gotten a little smaller. On January 14th Google released its’ update for the Google Translate app which now includes a radical new feature… translating spoken word! Now, you can speak into your phone and the app will translate and speak back your words in another language of your choice. This has the potential to make traveling and communicating abroad much easier, because no one has the time to play charades with strangers! Another cool feature of this update includes Word Lens,which allows you hold up your camera to text and have it automatically translated. However, according to Mashable, this only works for English,French, German, Italian, Portuguese, Russian, and Spanish, other languages will still require you to actually snap the picture. Luckily, an internet connection isn’t needed to use Word Lens, so translating text can be done anywhere. These updates are available to both IOS and Android users, so go forth and translate. Are you excited to start using this new update? Amazon Echo part speaker part voice activated personal home assistant is new on the market and has consumers wondering what this product is for. Alexa is Amazon’s new version of Siri, which when asked can set alarms, reference the dictionary and play music. Echo has some promising features, but at this point seems slightly out of place. Amazon’s main objective is to sell products, but it is unclear at this point whether the functionality the Echo will provide highly marketable. However, Amazon has had success in the past with technological gadgets such as the Kindle when ahead of the market. It looks like Echo is making its way to the smart home scene just in time along with Google and Apple’s new home smart gadgets. According to Mashable, Echo could take Amazon from one-click purchase to no-click purchase, creating the ultimate in-home impulse purchase engine — all done with voice command. this new smart home technology could be a change in the future, making online shopping, downloading audio books and simple day to day questions easier and more convenient than ever. When addressed, Alexa, the Echo will listen and respond to questions, tasks and commands given to the device. The purpose of this product is to add a smart technology feature to homes and aid in day to day tasks. Smart home devices are a rapidly expanding market, and Amazon’s new product is currently being tested by being sent to some Amazon Prime members to test the product and receive feedback. According to Mashable the device runs around 99 for Amazon Prime members for a limited time and 200 for other customers. Recently, Facebook has released a new update allowing for a more organized way to post batches of photos from your smart phone. According to Mashable , Once an iPhone or Android user uploads a set of pictures from their mobile device, the app generates a quick preview of how the photos will be displayed and then allows users to rearrange image order. This can be done by holding the selected photo and dragging it to the desired position. This update is compatible for selecting up to thirty photos at a time including tags, captions and locations. Now smartphone users are able to control photo order from the convenience of their phones rather than being limited to having this control on just website uploads. According to Mashable, Facebook is positioning photos as more of a platform for telling stories about everyday moments, rather just a place to store albums of hundreds of photos. This places emphasis not only on the large album uploads, but the importance of smaller photo uploads telling a story or updating Facebook friends. These smaller uploads are coined stories, which are different from albums in size, focusing on sharing in the moment with one’s Facebook community. Fitbit recently unveiled their new and improved super watch the Fitbit Charge, just in time for the Holiday season. Six months ago the company recalled their product the Fitbit Force to due the nickel content in the surgical steel affecting some consumers causing allergic reactions, thought limited in cases according to Mashable Fitbit offered a full refund, and worked hard to come back with a new and improved product. During this release, Fitbit introduced the three products it is releasing within the next year. Products include the Fitbit Charge, the Fitbit Charge HR, and the Fitbit Surge. Currently the only product available for purchase is the charge which offers special features that track steps, calories burn, and sleeping patterns, which can then be synched to your smart phone. The fit band also displays incoming calls and messages, so you can check your wrist before reaching for the phone. So far the Fitbit products come in black and slate, but new colors such as blue and burgundy will be released in 2015 according to Mashable. The FitBit collections offer the combination of hardware and software unity to take health tracking to the next level. Relying on smartphone devices is less efficient, than synching the features of a smartphone and smart watch. The Fitbit HR offers heart rate monitoring during physical exertion and rest periods alike, offering extensive health insight for only a 20$ price increase. the Fitbit Charge HR offers heart rate monitoring, GPS, sleep analysis, and activity tracking. Unfortunately these two products are yet to be released to the market, but we will patiently await their release, and look forward to taking health tracking to a new level. HBO has recently announced its intent to do a standalone streaming service starting in 2015. No longer will college student’s borrow their parents HBO GO access accounts. A recent trend in entertainment is the shift from television viewing to online video streaming. According to the The Daily Titan 1 in 3 people in their 20s and 30s watches Netflix or some other streaming service more often than they watch television.Now HBO fans will not have to pay for a pricey cable subscription to view their favorite shows. HBO is looking to make a profit on their extensive list of shows and merge into the online streaming market which offers factors of ease, convenience, and reduced costs for online streaming service users. According to The Source , the CEO of HBO is attempting to target the 80 million homes who do not currently have HBO. A HBO standalone streaming service would compete with other top online streaming mega-giants like Hulu, Netflix, and Amazon Instant Video. It is rumored, however, that HBO could be charging up to $15 a month according to Martin Peers at The Information , it will be tough to compete with the cheaper options of Netflix and Hulu offering services for $7.99 and $8.25 for Amazon Prime respectively. It is assumed their transition into the online market will flow seamlessly, and game of throne fans can now breath a sigh of relief, cut their cables cords, and continue their viewings online. Social media has been extremely influential during recent political unrest around the world. Some examples include the use of social media to coordinate revolution during the Arab Spring according to Engadget. Earlier in 2011, The Egyptian government restricted use of the Internet, SMS and other methods of communication in attempt to control the riots. In March,Turkey banned YouTube in order to prevent continued videos of government corruption from leaking to the public. At the time, Twitter was also banned, in attempt to presumably limit the spread of corruption videos and prevent informing Turkish citizens of such scandals. Activists in the Ukraine have been gaining attention by tweeting hash tags and photos encouraging thePresident to talk to the citizens and keep them informed. The movement was started by Maxim Savanevskij,according to Yahoo,who is encouraging the political figurehead to inform citizens of the reasons and motives behind the government’s actions. Censoring social media is just one example of Chinese government officials attempting to curtail awareness of the protests. Students and protesters have been creative when attempting to circumvent the communication cut offs. Using apps, such as FireChat, allows for protesters to communicate should the government cut off or restrict cellular data. This app allows people to communicate when there is no Wi-Fi or cellular data, and avoid firewalls. As of now Chinese government officials are attempting to contain the protest, and prevent the rest of China from knowing of the current turmoil through web restrictions. This morning at 10am PST, the whole world gathered for the unveiling of the highly anticipated iPhone 6 at the Apple Live event in Cupertino. However, Apple not only revealed the details of the next iPhone but also debuted their very first product in the world of wearable technology. The Apple Watch, described as “a smartwatch with inductive charging, a square face, sapphire glass, swappable bands, a heartbeat sensor and a rotating digital crown” by TechCrunch, is Apple’s sleekest new product proving their innovation in the advancement of technological development. While Apple made it very clear that the watch is not simply an iPhone on your wrist (the watch is only compatible with iPhone 5 and 5s), the list of applications and functions available on the watch holds its own against its mobile counterpart. The design of the watch is classic Apple, with remarkably clean features and lines. All the watches use the innovative “digital crown”, aka the spinning thing on the side of the watch, to access the different interfaces and utilities. WATCH: The standard 38mm and 42mm watch faces with leather and stainless steel bands in a variety of loop designs and colors. WATCH SPORT: Made to withstand sport-style use, these watch faces are made with a 60 percent stronger alloy case. This collection also includes a “sport band’ made of durable Fluoroelastomer in a variety of bright colors. WATCH EDITION: This collection seems to be the high-end collection, with Rose and Yellow 18-karat Gold 38mm and 42mm watch faces and leather straps. As of 1pm on Tuesday July 1st, Songza is officially part of the Google Family. For those who don’t know, Songza is a music playlist streaming service from Long Island that has gathered about 5.5 million users in its 6 years of existence. Songza’s curation algorithm—or its “concierge” option, is unlike any other service in that it takes into account the activities the listener is participating in at the time of day and creating a playlist to fit that specific, unique environment. The range of activities is extensive—ranging from “Lounging In a Cool Hotel” to “Waking Up On The Right Side Of The Bed”, and my personal favorite, “Shopping At A Vintage Store”. Renowned music industry veteran Jimmy Iovine’s new project is almost ready to be released to the public. It is a new, online, subscription based music service. Now that in itself is nothing new as we already have Spotify amongst other streaming services. So what’s different this time around? What will make this successful?? Take a look as I attempt to break down several different features of this new service recently named: Beats Music. The CEO & co-founder of Beats Electronics, Jimmy Iovine, plans to launch his new online music streaming service Beats Music (formally known as project Daisy) in the next couple of months. Noticing the lack of context and emotional connection in music streaming today, he has recently hired an expert team of curators to give the online music streamer a more personalized experience. If you want to find out who the curators are just click here. Vine recently updated their iOS app with some major revamping, which will particularly please those who primarily use Vine to make stop motion videos. Ghost feature: tap on the ghost icon in the lower right corner of the camera to activate this feature, and it keeps your last frame transparent so you can align your next shot for a flawless stop-motion capture. Focus button: this allows the camera to focus on one object in the shot, and is a much-needed update as many users have previously struggled to focus in their Vines. Privacy: Vine now allows you to set your account to Private, similar to Instagram’s privacy feature. 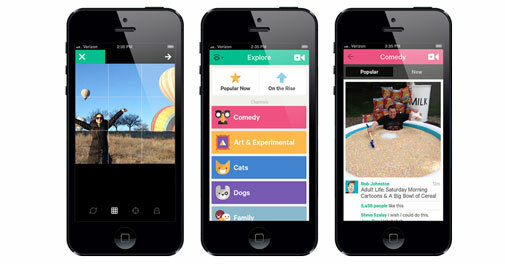 “Re-vine”: Essentially the Vine version of a Retweet on Twitter, Vine now allows you to Re-vine someone else’s video. Categories: Vine added 15 new categories for users to browse through popular videos: comedy, art and experimental, cats, dogs, family, beauty and fashion, food, health and fitness, nature, music, news and politics, special effects, sports, urban and weird. As of today, Instagram now allows embedding of Photos and Videos on desktop. Once embedded, it will show your Instagram handle above the image or video, and notes at the bottom. Once someone clicks on your photo or video, it takes them to your Instagram Web Profile. So, who do you think is winning this war on social media video apps? In anticipation of Jay-Z’s upcoming album Magna Carta Holy Grail, the Record Industry Association of America (RIAA) announced on July 1st that they would be tweaking their rules regarding Gold & Platinum Certification for digital albums. Jay-Z announced earlier this summer that the first 1 million copies of Magna Carta Holy Grail will go to Samsung Galaxy phone users, and available 72 hours before the album’s wide release on July 9th. says Liz Kennedy, the Director of Communications and Gold & Platinum Program at RIAA. I used to watch Back to the Future and dream of how cool the world would be once we all had hoverboards and time traveling Deloreans, but as it turns out, the truth just might be stranger than fiction. Ladies and gentlemen. I give you the bizarrely great new tech of the future that is happening right now. Crazy right? Here are a few of my favorites so far. The Tupac Hologram of Coachella is not really new news, but this is the stuff of Star Wars people. We are living the dream. There are so many possibilities at stake in the entertainment world and I can not stop geeking out about it. Supposedly there is to be a TLC Reunion … this pick is for you Lisa ‘Left Eye’. Again, the concept of solar power has been around for quite some time, but according to this MIT Technology Review, there is a solar power conversion that will harness 50% of the sun’s energy versus the typical 20% that exists at the moment. The implications this can have for sustainable and affordable energy could mean great things for our future. Most of the digital ticket providers that have become staples for any saavy concert-goer or event attender are largely fan focused. While the efforts of these services are exemplary, focusing on the fans can be more harmful and chaotic than helpful in the long run. CrowdSurge, launched in the UK in 2008 is a fairly young establishment with a big undertaking: CrowdSurge seeks to build a direct bridge between artists, events, venues, etc. and fans. While this doesn’t really seem to be a new angle for ticketing services, many have failed to accomplish this task, often leaving enough of a gap in protection of the artists/events that scalpers and other nefarious types are able to exploit a good show. Creating a void in data collection for the product providers and a bad experience for the fans. In the case of this particular service, much of the control goes back in favor of the product providers rather than the fans, re-establishing a bit of order in the wild-west that can be ticket purchasing. Allow me to further pontificate my claims through a brief analysis of some of their services. MOG has recently launched a free 60 day trial version of their award winning on-demand music service, which creates an easy way for music fans to listen to their favorite artists while also expanding their knowledge of music. Facebook chat is a powerful feature within Facebook that has become increasingly popular. Now there’s even more reason to celebrate. Allow me to introduce you to Facebook Chat - Everywhere. Starting yesterday you can now send and receive chat messages from your favorite desktop instant messaging client. You’ll never miss a message when you leave Facebook and you’ll be in total control of how and where you chat with your Facebook friends. Hooray? Check it. MusicDNA - MP3 on steroids? Norwegian developer Dagfinn Bach, who worked on the first MP3 player in 1993, and Karlheinz Brandenburg, the inventor of the MP3, revealed the â€œMusic DNAâ€ files at Cannesâ€™ Midem music conference. The â€œMusicDNAâ€ file will be able to update with new information whenever the file is activated. â€œWe can deliver a file that is extremely searchable and can carry up to 32GB of extra information in the file itself, and it will be dynamically updatable so that every time the user is connected, his file will be updated ,â€ Bach said. Update examples would include - blog posts, tweets, music, lyrics, videos, artwork, tour dates, etc. The information given with the legally downloaded “MusicDNA” files will update automatically, but pirated files will remain static. There will be a beta launch in spring. If all goes well with the beta launch, the full roll out of the â€œMusicDNAâ€ files is expected summer 2010. Independent labels including UK-based Beggars Group â€“ home of Arctic Monkeys and Radiohead â€“ as well as Tommy Boy Entertainment and Delta records in the US are on board, though no major labels yet. Each “MusicDNA” track will likely cost more than $1.29 - what iTunes is charging for their newer tracks. â€œOut of a rusted old VW Beetle we are making a Ferrari,â€ said Bach Technologyâ€™s Stefan Kohlmeyer. â€œWe are taking an existing idea, giving the end user a lot more and making that file much more valuable â€” like transforming a tiny house into a huge villa.â€ Good stuff. It looks as though facebook, is now watching over the content we post and the frequency of the postings. I thought this functionality was pretty cool at first - I liked how facebook was looking out for the well-being of the fans and what they supposedly wanted. That lasted for about a minute. I then became a bit annoyed that facebook had this power over me and wouldn’t let me continue with the work that needed to be done. It was all a little too “big brother-esque” for me. I can understand and appreciate what facebook is trying to do for the fans in this situation. However, those tour dates needed to get up in order for the page to have the latest and greatest content. Isn’t that what a facebook fan page is for? Further, I wasn’t publishing any of the events on the artist’s wall so no one was even seeing them. Perhaps it’s a bug or perhaps it isn’t. What do you guys think of this facebook warning message? Good idea or bad idea?